This week the Phy team got our hands on a new PCB milling machine called the Othermill from the folks over at Other Machine Co. (OMC) — a San Francisco startup determined to bring desktop PCB manufacturing back into vogue. And this was no loaner…let’s be clear: we’d purchased the Othermill cash (ok CC) at full MSRP, after getting a live demo onsite at the OMC HQ in San Francisco. So this early review (a more detailed look will follow in subsequent posts) is not biased by their generous offer to outfit Phy’s labs. In fact, at $2199 + tax, you can bet we’d be more than a bit hot-headed if this little device didn’t perform as advertised. But just when I thought I was over milling for good? 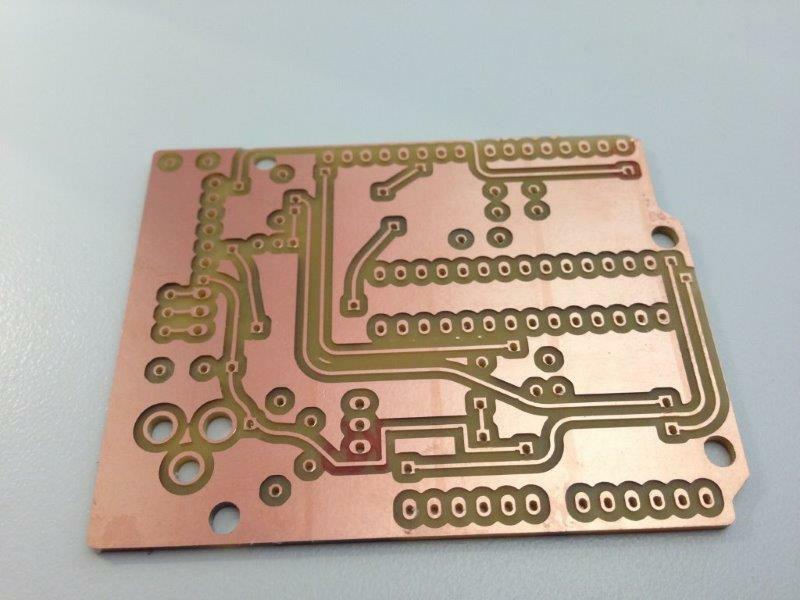 Well, the Othermill just reignited a latent frustration since the last time any of us had milled PCBs on the bench: the inability to build real electronics, reliably, in a day. And the Othermill may just go a long way toward solving that conundrum for a whole new generation of the hardware-minded. And just before we get into the technical mish-mash — let us also stress that for what it’s worth, we have owned or operated on the order of at least 4 PCB milling machines over our respective careers. And no slouch, home-cooked models either, but rather 1x LPKF, 2x Roland (MDX / Modela models), and access to another higher end LPKF mill thru a company I was working for many, many moons ago. All told, including the Othermill, that makes 5 machines spanning something like 15+ years. The premise was and remains a good one. After all, what aspiring entrepreneur or maker wouldn’t want the ability to fast track electronics at a pace more familiar to the likes of software engineers? Likewise, we hardware professionals (hackers at heart) have long sought the ability to design, build, & test a PCB in the same day, much less before lunch! 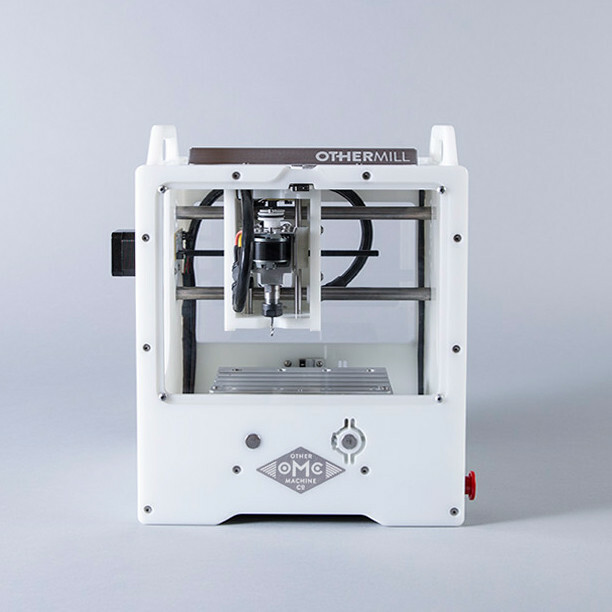 So, coming off the campaign, the OMC team labored thru more than 10 iterations and 8 months, dialing in their manufacturing process, before finally filling those Kickstarter orders…and fast forward another 12 months to Dec 2014 when it was finally time to release the Othermill V2 to anyone that might want one. Being the gadget masters that we are (ok, me personally) we had to have one. Firstly, the Othermill isn’t something you order and arrives 2 days later, via Amazon Prime. At least not yet. Instead, the mill is on backorder (trusting that’s a good sign) and though they’re working hard to get the machining right and build quality gear; the average wait time for a mill is running a painfully loooong 6-8 weeks…Which for a $2200 gadget, feels like nothing short of eternity as you discover all sorts of nails just waiting for your hammer to arrive. 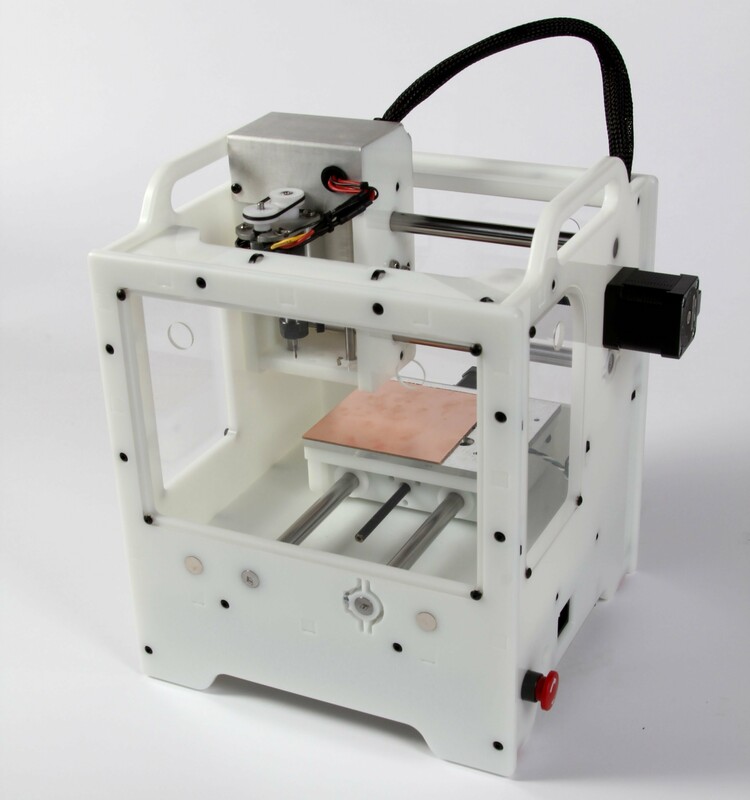 And at first glance, the Othermill V2 doesn’t look like any benchtop mill we’ve seen before. It’s compact, measuring 10.25 × 10 × 12.75 in. It’s also lightweight, weighing in at 16.8 lb, and yet feels sturdy, despite it’s modest stature. The handles imply of course that the mill is portable, which – with a proper generator – just might prove incentive to finally attend that family reunion at the beach (at 150W, best not to drive it from the car battery). The assembly of the mill was truly painless. 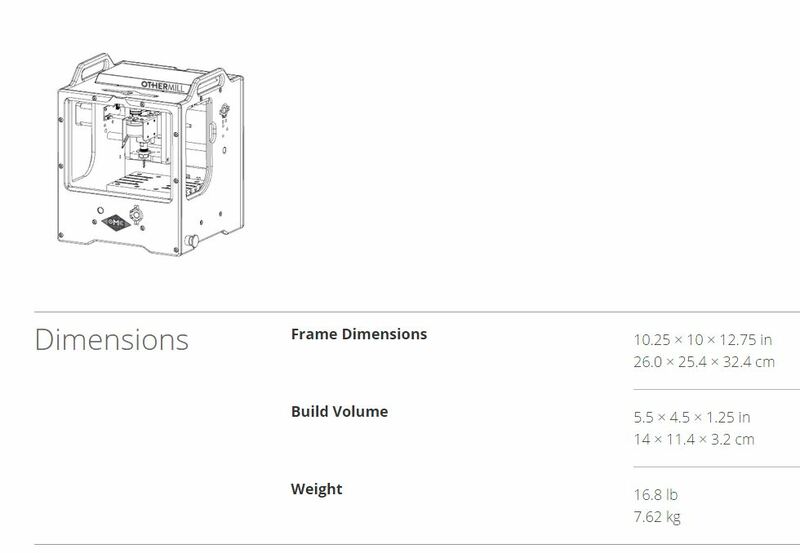 The Othermill comes preassembled with 4 plastic protective shields (windows) and a spring collet that needs to be installed. Other than that, it worked out of the box. 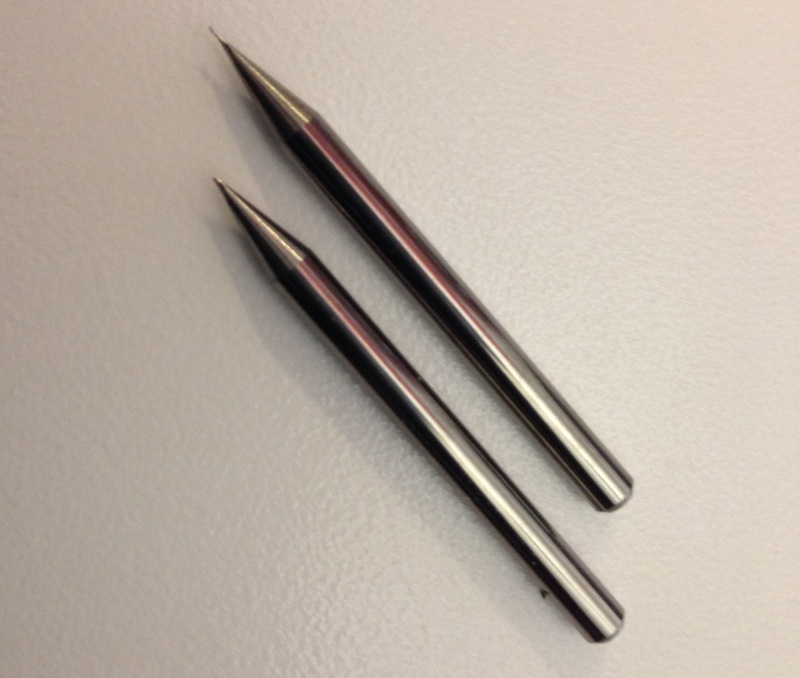 And included are two endmills, one 1/64 and one 1/32 flat end mill, both ideal for PCBs. Now for our sort of designs 1/64th was still far too wide an endmill for the PCBs we were building. So we ended up ordering a handful of 1/100 endmills good enough for 10mil tracks and 10 mil spacing, but alas not quite good enough for most BGAs or QFPs. 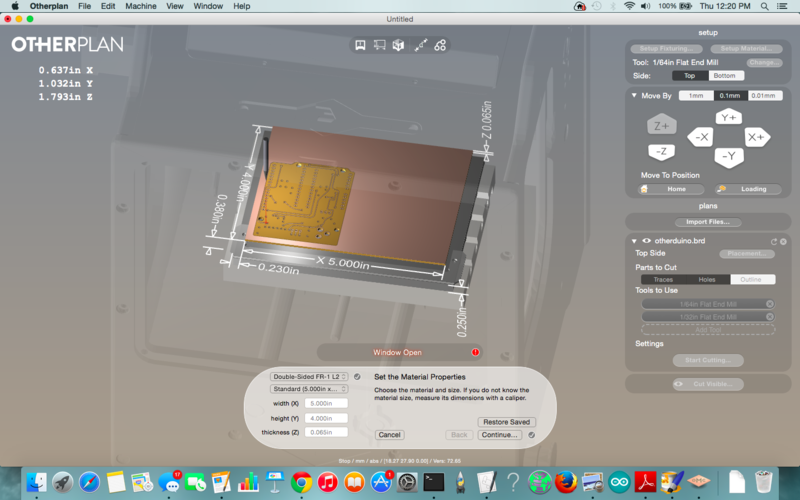 Anyone who has owned a mill or operated one, learns the hard way that going from design to milled PCB is riddled with fiddly steps…Each of which unpack into a timeline that is almost never what you’d expected. Sometimes painfully so. And so much of this has to do with finnicky details like zeroing the mill, determining the bed height, locating brackets / fixtures, configuring material parameters, setting up endmill details in the software, and converting whatever design files you have to something that can actually be milled out, to name a few. Not so with the Othermill! The second example I ran thru was a real PCB — an Arduino clone they call the Otherduino. All-up, the machine took roughly 4 hours to mill both sides of a board measuring 2.7 x 2.0 inches, and did a pretty solid job of it, though the thru-hole design was clearly not intended to push the limits of benchtop milling. Still, the design sailed thru the machine and the accuracy was spot on. Limited burring, very little, if any delamination, and nice routing paths. So 10 mils you say? Unfortunately, this limit is something that may never go away and as such, may well prove a deal breaker for anyone using some of the fine pitch parts increasingly common today. 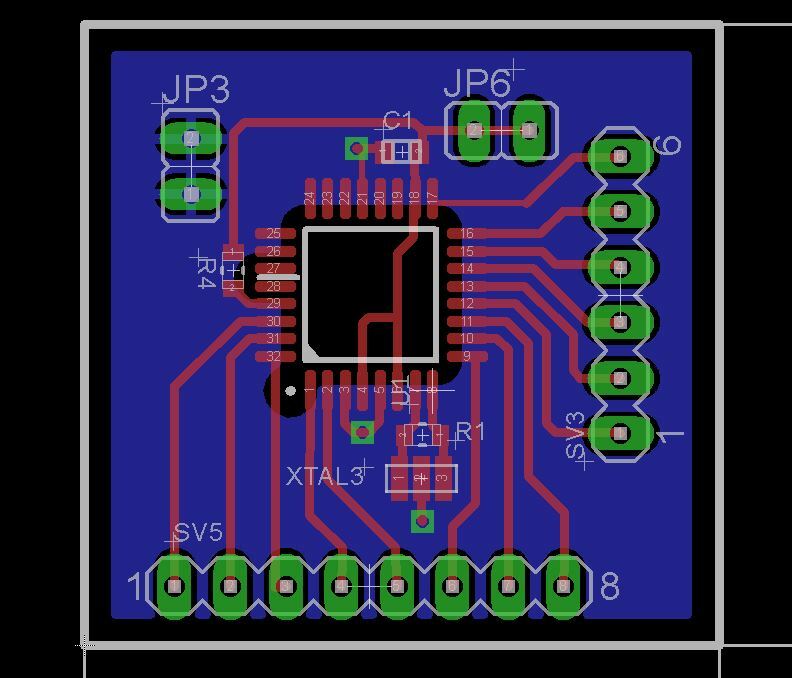 This next design followed the Arduino theme, though using the ATMEGA328P-AUR in the MS-026-ABA JEDEC package on a little board we’d designed custom in Eagle.. The first thing we noticed was that following the JEDEC package spec still wouldn’t work out of the box because our pad to pad spacing was going to end up less than 10 mils (recall this is the area between pads, not the pad pitch). So with a few mods to the footprint, we managed to narrow the pad width a bit and increase the spacing to something large enough for the endmills we had on hand. We also routed this board using 10 mil tracks in some areas and 16 mils in others, depending largely on what was nearby. We used a few vias with 20 mil diameter holes and decided to throw a polygon on the bottom side of the board for good measure. Lastly, we dropped the thru-hole caps, instead replacing them with 0603s and used a tight CSTCE16M0V53-R0, 3-pin resonator with integrated caps to top it all off. Altogether a reasonably standard design by today’s measure but something that would certainly keep ‘em honest. And how did it fair? The Othermill made reasonably short work (1 hour or so) of this design which measured 30x30mm, with only a few things we’d classify as “unexpected,” given our experience with benchtop mills. 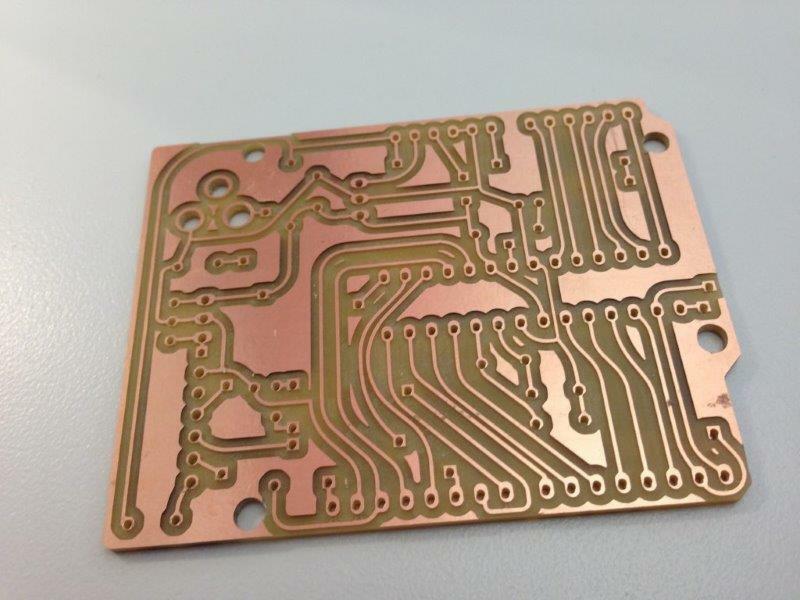 Still, as some folks are new to this space, it’s important to know what you’re getting when milling PCBs in the lab and we’ll detail a bit more on this later on. Never the less, the Othermill did a great job at 10 mils. Minimal burring, only a few “overmills” and zero delamination. We used three endmill sizes including the 1/32, 1/64 and 1/100 in endmills — all flat end. You can see we had some alignment issues which unfortunately are part and parcel of not having a more sophisticated jig setup when milling things to these tolerances. Though the supplied bracket did a world of good in making the result look at least respectable. The Othermill is an amazing little device. It is well designed, well constructed, and just an altogether improvement over previous mills we’ve used. Topping the list again is the software. Heaps of machines can get to the resolutions of the Othermill, but what blew us away was the ease with which we could get going. 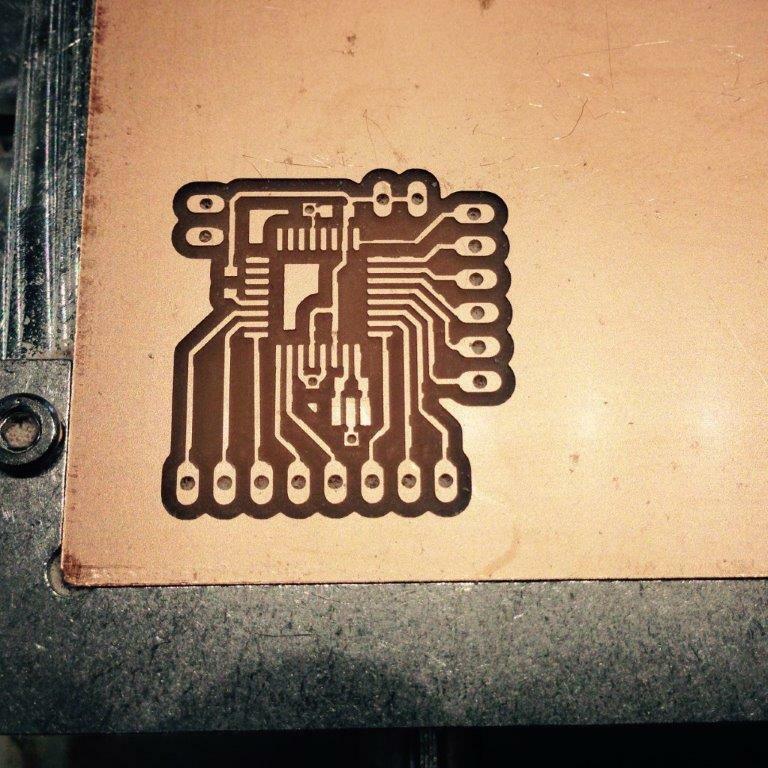 Othermill takes a BRD file (PCB file) from Eagle directly as one of the input methods. 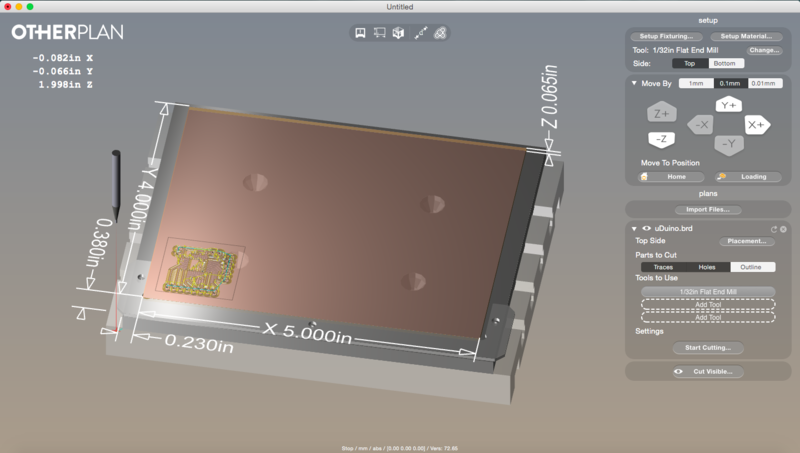 That said, all we had to do was muddle our way thru Eagle (Altium guy, sorry) and when we were finished; we had only to load the board file into the Othermill software and we were ready to go. Similarly, the calibration step is about as automated as it could ever be. With power to the collet the Othermill will slowly lower your endmill on tool changes and detect the surface of the spoilboard automatically (the spoilboard is that metal plate on which you intend to mill). Much cleaner than doing this with arrow keys on the Modela and much faster as well. Using this same method, it will also identify the boundaries of the supplied bracket; so again, making this far easier than anything we’d used in the past. 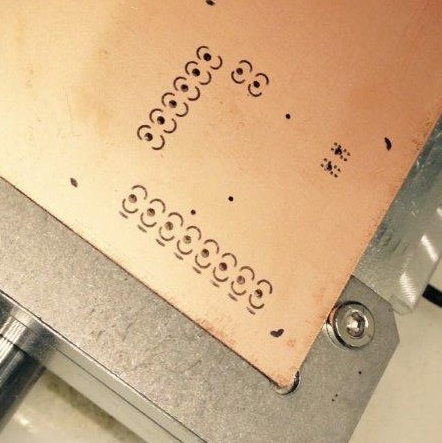 We did break one 10mil endmill in the process of milling the PCB but this is to be expected at this resolution and is hard to avoid with endmills this small. Though to be fair, we have to say that thus far, it’s been largely Othermill gear, with Othermill materials, and all working in a pretty insular environment. Still, this early success is key and if it continues as we step it up this coming week, we’ll have plenty more to be excited about (either way, we’ll have more to write about ;). Like Microsoft Executives have said for years…supporting every conceivable piece of hardware and software developed by a range of folks with varying skill levels is a hard task. So the fact that we’re working in the controlled environment is not the best example of how the Othermill will perform when let loose on any variety of probelms. Still, if it were to fail on these fundamentals (cough…makerbot…cough), it would be a disaster. A few frustrations do exist though. Firstly, the software is currently only running on Mac. <sigh> As an engineer who grew up on CAD tools, I almost exclusively use Windows. It is just the standard for top-end PCB tools and thus using Windows is not optional. Thankfully I also have a Mac so this was a no brainer to install and get running. However if you didn’t, the added cost of getting some Mac HW to drive the already $2200 machine is something to consider. Regarding the cost also — the Othermill didn’t come cheap. However consider how many kids have makerbot footstools under a bedroom desk. I know that’s where mine sits and know many folks who also share in my “most expensive ottoman I’ve ever owned” sentiment. I only wish the Othermill had come out sooner as it may just have spared me the 3D printing frustration as I would have been far too busy building boards to half-print distorted blobs of PLA. Vias are just two rings on opposite ends of a board, with no conductive plating along the Z axis to join them (mills don’t plate). 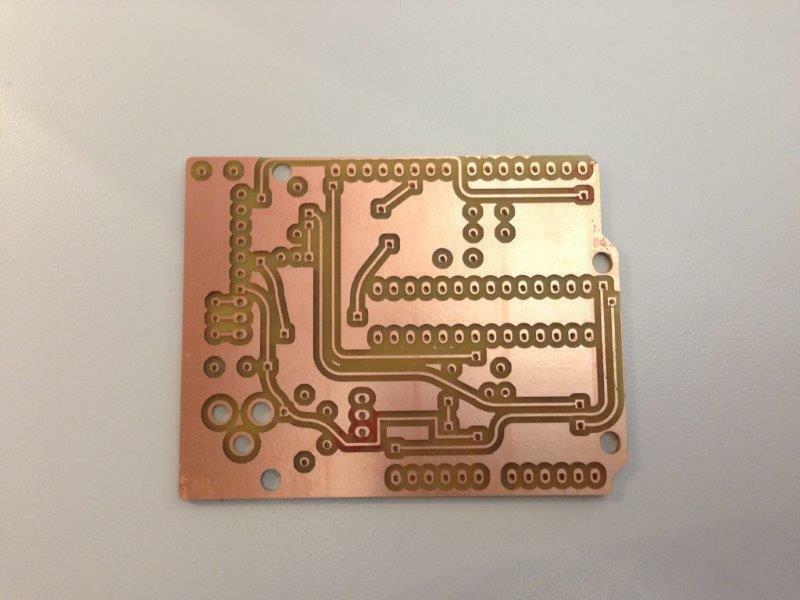 What’s more, the lack of hole plating makes it all the harder to plug vias on milled PCBs. Consider a strand of wire or a component pin to create surface tension that draws solder into the hole if you get stuck. Along those same lines, consider that thru hole parts with tracks connecting to pads on both the top and bottom sides (same pin) are not connected unless you solder that pin on both the top and the bottom. This can be particularly complicated for connectors that may obscure the solderable area on one side or the other. Alignment can be an issue when flipping the board. Plan to use a jig or at least a bracket to ensure alignment. Othermill ships with one. There’s also no soldermask on milled PCBs and that will become painfully obvious if you’ve only ever used fabricators for boards. Feel free to “spread it around” as you will find that solder can quickly get away from you and start spreading down the length of tracks or polygons. Just go with it. A tip is to dope the area along the track with a bit of solder just to prevent too much run-off. Same lines, be exceedingly careful of bridging as you don’t have the same solder resistant surface supporting you. Flux is your friend, be sure and use it. Endmills break and the smaller they are, the deeper you cut, the more prone they’ll be. Have multiples of all smaller endmills on hand and cut only as deep as you need to. Remember: just because you can draw it, doesn’t mean you can build it. Use a mix of tool sizes including larger tools for clearing large areas. Spare your smaller tools in the process! Avoid acute angles in PCB routing and with polygons. This will prevent the mills from routing into areas you expect copper to be removed (the angle will approach a width which may be smaller than your smallest mill). Avoid FR4. The substrate material contains fiberglass and the dust is terrible for you. Use FR1. OMC provides only FR1 blanks for purchase. Thank you very much for this post. I am new to CNC machines. I look forward to your future posts. On end mills, Othermill’s range in price – the 1/100 costs $21… this gets expensive…and I seem to easily break end mills. What are your thoughts/recommendations on end mills? It seems a great razor/blade business model for other machine co, but for me these blades get expensive. What about different end mill sizes? Not just sub 1/100 (A few components I use have spacing a tad less than 10 mils – but I did what you did….adjust the pad size)…but using any end mill size? The mills I’ve had the most success with in the past have been from Kyocera and they were for the longest time, sold thru Roland as accessories for the Modela MDX-40 that I have. They were historically a little more expensive but lasted longer than I would have expected. The cost is the killer of course and getting a decent set of endmills with multiple types and flute-counts together can easily add up to and extra $200-300. For this post, I only used the mills from Other Machine Co. and they performed well though I’ve only had them for 2 weeks and have only done two PCBs at 10×10 (tracks / spacing). The Kyocera are also 1.25mm shafts so they fit just fine into the OM. So left to right that’s EM = Endmill, = Flat end or ball + ‘-‘ + 125 = shaft diameter + ‘-‘ number of flutes + ‘F’ + ‘-‘ + Size in inches. Example -> EMF-125-2F-063 is an Endmill, flat, 1.25mm shaft, 2 flutes, 0.063″ diameter. If you search that term, you’ll find the Kyocera stuff for sale on the web, but again, I’m not sure they are any better than what I’ve gotten from OMC yet. I broke one 0.01″ EM so far but need to do a little more testing this week! More details to follow! oh…i forgot to ask…do you use double sided sticky tape to keep the board in place? If so, how do you remove it? When I do it, the tape won’t budge. I can take a butter knife to it or… but I don’t want to mess up the copper. and regarding FR1 boards. Are there other places besides Other Machine Co you’d recommend for purchasing? I’d just like to know options as I start doing more-n-more of these since these expenses quickly add up. I use tape (Scotch permanent dual sided tape, cat. 3136) and the way I remove the board is with a box-cutter / utility knife, with a good stiff blade (like a Stanley 10-099 or similar). I use the sharp edge (be careful) to just create a little lift all around the areas of the board I can get at (usually 3 sides with the bracket in place), then I flip it over and use the back edge to slide around the perimeter and lift it. If I have milled a board that is cutout of a larger piece, then I tend to remove that section only (either with the utility knife or a jeweler’s screwdriver tip) and leave the remaining blank in place, setting the origin for any new boards to somewhere in the remaining unused area. This means far less waste and less risk that I bend the board by removing it, thus risking whether I can use the remaining area. When using double-sided tape, I leave extra tape sticking out from the sides/top/bottom (depending on how you orient the tape) and it makes pulling the board + tape off much easier. Grab two of the extra tabs of tape pull up slowly until the board starts to lift as well. This doesn’t work as well with the alignment bracket. I have also found that double-sided scotch tape works well for most applications and is much, much easier to remove than the 3M stuff. Ahh, good call! I suspect that even with the bracket, it would give you some leverage anywhere the corners were exposed. For example my bracket is U-shaped and open over most of the board area except the corners closest to the front. So this works wonders. Great tip! For removing the double sided tape goo, once the board is off the machine, try a little bit of > 90% rubbing alcohol. I hope they add engraving to their automatic PCB pathing. This would mean you could cut out smaller packages like TSSOP with a much stronger engraving bit than a 1/100th end mill. It sort of puts you out for making a fume hood and tailing vacuum when just laser printing litho mask for CuSO4 etch is better. Better still to photo etch after page-width inkjetting. So it is nice that it didn’t go like the Roland and do toddler Maximum Overdrive things. When is it going to be worth the router bits to run? 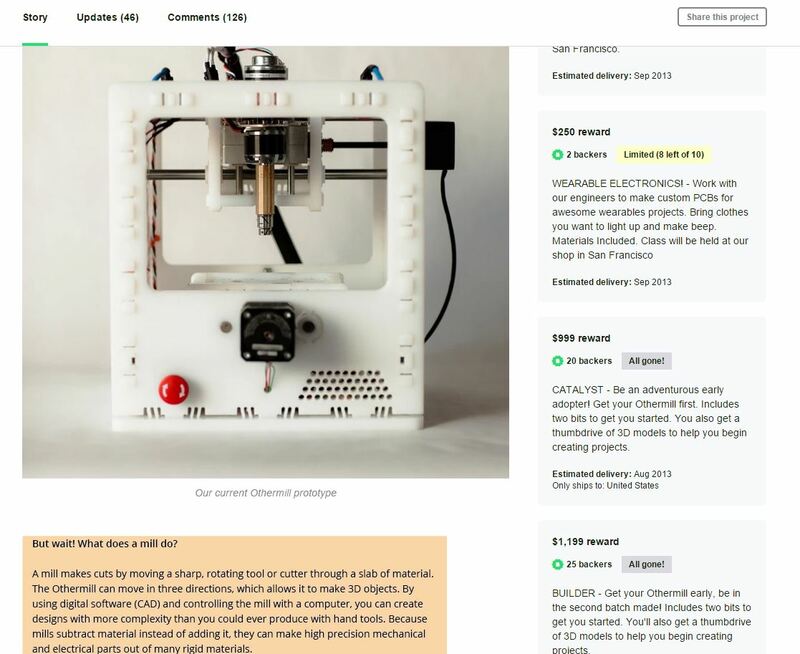 Great write up on the othermill, have you done any follow ups to this? I’d be interested how it’s been going since this article was posted.